The same dining room table can be too tall, too short, or just right, depending on the chairs that you plan to use it with. If your table is too short in relation to your seating, a few inexpensive solutions can provide quick and easy fixes for the problem. A too-short table can be uncomfortable to use. 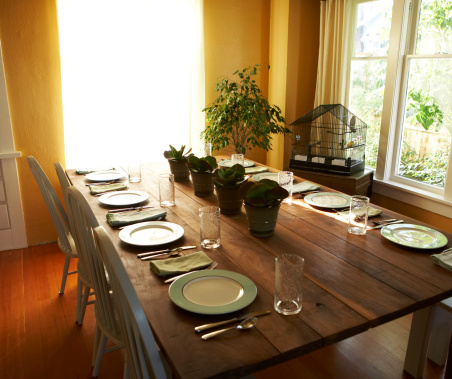 Rather than trying to raise the table, simply shorten the chairs. Mark the legs clearly at the point where you want to cut them. Cut each leg using a circular or hand saw, then sand the base of each leg when you are done. Adding castors to a table automatically adds 1 or 2 inches to the height. It also gives the table the added benefit of mobility. Purchase castors at your local hardware store and follow the instructions for installation. They come in many different styles and colors. Add small plastic blocks -- marketed as furniture risers -- to the base of your table. These are often used for beds, but work well for tables, too. If the legs are too thick, add pad feet or wooden finials. Wooden finials often already have a screw in place to attach to the table. Based in Atlanta, Crystal Huskey began writing in 2008 for various nonprofit organizations and news agencies. She now serves as the assistant editor for a hyper-local news site. Huskey is completing her Master of Arts in international relations at American Public University.